Son of Jacob Canisius, a wealthy burgomeister, and AEgidia van Houweningen, who died shortly after Peter's birth. Educated in Cologne, Germany, studying art, civil law and theology. He was an excellent student, and received a master's degree by age 19; his closest friends at university were monks and clerics. Joined in the Jesuits on 8 May 1543 after attending a retreat conducted by Blessed Peter Faber. Taught at the University of Cologne, and helped found the first Jesuit house in the city. Ordained in 1546. Theologian of Cardinal Otto Truchsess von Waldburg, Bishop of Augsburg in 1547. He travelled and worked with Saint Ignatius of Loyola who was his spiritual director in Rome, Italy. Taught rhetoric in Messina, Sicily in 1548, preaching in Italian and Latin. Doctor of theology in 1549. Began teaching theology and preaching at Ingolstadt, Germany in 1549. Rector of the university in 1550. Began teaching theology, preaching in the Cathedral of Saint Stephen in Vienna, Austria in 1552; the royal court confessor, he continued to worked in hospitals and prisons, and during Lent in 1553 he travelled to preach in abandoned parishes in Lower Austria. During Mass one day he received a vision of the Sacred Heart of Jesus, and ever after offered his work to the Sacred Heart. He led the Counter-Reformation in Germany, Austria, Bohemia, and Switzerland, and his work led to the return of Catholicism to Germany. His catechism went through 200 editions during his life, and was translated into 12 languages; in some places catechisms were referred to as Canisi. Attended the Diet of Augsburg in 1555. Founded Jesuit colleges in Ingolstadt, Prague, Dillingen, and Fribourg. 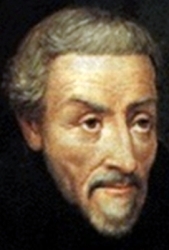 Jesuit provincial superior. Attended the Diet of Ratisbon in 1556 and 1557. Everywhere he worked he became a noted preacher, and often worked with children, teaching them and hearing their confessions. Represented Pope Paul IV at the imperial Diet of Pieternow. Addressed the Council of Trent on the Sacrament of the Holy Eucharist. Recommended Saint Stanislaus Kostka for reception as a Jesuit. Court preacher to Archduke Ferdinand II of Austria. 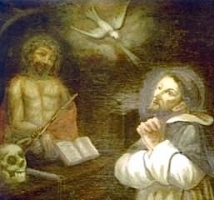 While in Fribourg, Switzerland, he received a message from the city's patron saint, Nicholas of Myra, that he should stop travelling; Canisius spent the rest of his life there. He taught, preached, edited books, and worked to support the Catholic press and printers in many cities; his advice was sought by Saint Francis de Sales, and by his friend Saint Charles Borromeo. Proclaimed a Doctor of the Church in 1925 by Pope Pius XI. His father died when Anton was small; he, his mother and his brother moved to Iasi, Romania in 1895. He studied in Iasi and Bucarest in Romania, and in Rome, Italy earning multiple degrees including two doctorates. Priest in the diocese of Bucarest, Romania, ordained on 24 September 1910. Taught at the Bucarest seminary. Parish administrator in Tulcea, Romania. Being an Austrian citizen, he was imprisoned in an internment camp during World War I when Romania joined the Allied forces; freed by order of King Ferdinand I. Rector of the Bucarest seminary from 1924 to 1948. Bishop of Iasi, Romania on 30 October 1947. In the post-World War II period, he became a vocal opponent of the Communists in Romania. Arrested on 26 June 1949, he was shipped from prison to prison, tortured, abused, starved, and left naked in the winter weather. Martyr. Priest in the apostolic vicariate of West Tonkin. Worked in the missions with the priests of the Foreign Mission Society of Paris. Imprisoned and repeatedly tortured in the persecutions of Minh-Meng. Died with Saint Peter Thi. One of the Martyrs of Vietnam. Studied at Padua, Italy. Joined the Dominicans at the Saint Zita priory in Palermo, Sicily. Priest. Noted preacher and evangelist throughout Sicily and Italy, winning many converts. Intense devotion to the Passion of Jesus. His example of charity and humility brought many to join the Dominicans. Founded the priory of Our Lady of Grace in Monte Cerignone, Sicily, and served the rest of his life as its first superior. Priest in the apostolic vicariate of West Tonkin. He worked in the missions with the priests of the Foreign Mission Society of Paris. Imprisoned and repeatedly tortured in the persecutions of Minh-Meng. Died with Saint Andrew Dung Lac. Martyr. Bishop of Antioch, Syria in 599. Fought simony in his diocese with the support of Pope Gregory the Great. Murdered by a mob during an uprising of Syrian Jews against Emperor Phocas who was trying to force conversions; because he died in anti-Church violence, he is considered a martyr. Priest at Nicomedia, Asia Minor (in modern Turkey). Arrested and tortured in the persecutions of Diocletian; he was offered release if he would denounce his faith; he declined. Martyr. Mercedarian monk at the monastery of Santa Maria della Pace in Naples, Italy. Staunch defender of the freedom of the Church from state control, and of his Order, he was known for personal piety and strict adherence to his Order's rule and orthodox Christian doctrine. Benedictine monk in Bobbio, Italy. In charge of the monastery's vineyard and 30 brothers assigned to help him. Legend says that once he ran nearly out of food to feed them, but prayed for help and was able to feed them all from a single cooked duck. Premonstratensian monk. Canon of the Mariengaarde monastery in Friesland (in modern Netherlands). Abbot of the house in 1230. Known for his scholarship and personal piety, he established comprehensive education for his brothers and required the study of the Church fathers. Joined the Mercedarians at age 27 at El Puig, Spain. Noted for a austere personal life and ministry to the poor. Sent to Algiers to ransom some prisoners, he decided to preach Christianity in a synagogue. Martyr. Shepherd at Myra, Lycia. Martyred because he would not tell the authorities where Saint Dioscorus was hiding during the persecution of Valerian. Thirteenth century Dominican missionary. Martyred by Muslims along with 27 companions whose names have not come down to us. Mother of Saint Benno of Meissen. Benedictine monk at Saint Michael of Chiusa where he built a church. Hermit on Monte Caprario. Bishop. Eighth century priest. Venerated at Bampton, England. Companion of Saint Themistocles of Lycia. 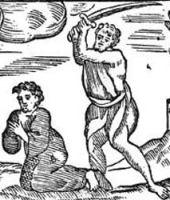 Martyred in the persecutions of Valerian. Bishop of Trier in modern Germany. Martyred with Saint Festus. Honoured in Tuscany, Italy. Martyr honoured in Tuscany, Italy.